All cats, even indoor pets, need to be vaccinated. Many viruses live in the environment, which means they can be transported by air or they can be brought into your house on your shoes or clothes. Also, with the number of feral cats in this area, a disease-carrying cat could easily wander into your yard or house. Your new cat should be tested for Feline Leukemia and AIDS (Feline Immunodeficiency Virus). Detection of these diseases is vital, since they are almost always fatal. Until your new pet is tested, it is a good idea to keep him/her away from other cats. 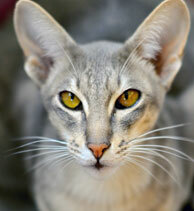 Provided that you cat tests negative for Feline Leukemia, the next step is to vaccinate. Cancer and other chronic diseases. The virus is present in saliva, urine and other body fluids and is typically passed from cat to cat by direct contact, including licking, biting, and sneezing. This is a combination vaccine that protects your cat against Feline Distemper (a.k.a. Panleukopenia), Rhinotracheitis and Chlamydia. o Feline Distemper is a potentially fatal disease among cats. It is a highly contagious, viral disease that can be spread through the air, contact with infected animals or even contact with places where infected animals have been. Rhinotracheitis is an upper respiratory virus that is easily transmitted from one cat to another. Kittens are particularly affected, but this disease can be dangerous in any unprotected cat, as effective treatment is limited. Even if a cat recovers, it can remain a carrier for life. Feline Chlamydia is a bacterial disease that is extremely contagious, especially in young kittens. This disease can be transmitted to humans by direct contact.